Sun, snow, wind, fog, rain, dry heat, dusty trail, desolate expanses of earth and sugar sparkling peaks; you can find it all while trekking through Patagonia. Our first day on the Dientes Circuit, 75+ mph winds were not uncommon while hiking during the day. Packing for a few months at the end of the world was a challenge in itself. What do you pack when you're going to a region notorious for its fast changing and extreme climate? The answer is, some of everything. That's probably the most exciting part of hiking through Patagonia. You can start a day in your tent, teeth clenched running in place in your sleeping bag to keep warm to shorts, sunscreen and dust grit in your eyeballs ten minutes later. 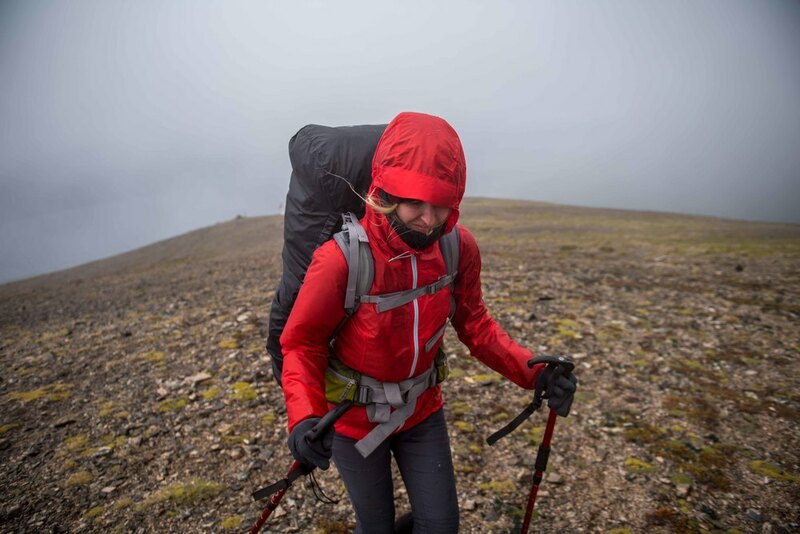 If you're looking for a true test of your mental and physical strength, head first to Puerto Williams to hike the Dientes Circuit on Isle Navarino, the worlds southernmost hike. Even though the island is almost impossible to get to and hard to leave, it's completely worth it and you'll find yourself wishing you spent more time here instead of the popular Ushuaia, the island’s neighbors just across the boarder in Argentina. The town has a quaint, relaxed feel and time will start to feel irrelevant as soon as you step off the boat. Often overlooked by crowds making their way to Torres del Paine, this is Chile's most remote trek, known for it's stunning views of the "Teeth of Navarino," and difficult navigating system. The circuit is outlined to take five days, four nights but we were forced to hike it in 3 days because of flash floods and a state of emergency on the island due to extreme rain. The circuit markers were few and far between. The advice we'd heard from others who had gotten lost out there was starting to make sense. We would breath a heavy sigh of relief every time we heard each other shout, "Rock pile!" Which meant one of us spotted the next rock pile (cairn) left by other hikers, letting us know we were on the right track. We had to be careful about when we would trust these clues though, we never knew if the previous hikers were just as lost as we were. Sometimes we’d stand in one spot and see rock piles in every direction, so we’d have to trust our gut and try to ignore the confusion. Even farther apart than the rock piles were the legit trail makers called "landmarks" that are coordinated with trail map. We were pretty confident and even getting cocky by our last day on the circuit because we had yet to get lost. But on our last day we found ourselves bushwhacking in mud up to our knees, in the dark. Nowhere near any red lines or landmarks. We heard about this trek by chance from another hiker at a hostel we stayed at on our way south. We took a leap of faith traveling all those extra miles to experience it for ourselves. Even though we endured the most uncomfortable conditions trekking by far on this circuit we would absolutely recommend make room for the Dientes Circuit on your list. If the Dientes sounds like it would put a little too much hair on your chest, you may want to start out farther north in a town called El Chalten in Argentina. Here you'll find the breathtakingly beautiful Fitz Roy mountain range accompanied by Cerro Torre all wrapped into a trek you can do in just three days. When we first arrived in El Chalten we weren't even sure where the Fit Roy was; whether we'd have to catch another bus into Los Glaciares National Park to the trailhead or if we would be able to reach it from town. We’d been told by a number of people that they'd been in El Chalten for days and had never been able to see the Fitz Roy because of the cloud cover, so we started to get a little nervous. Later that evening we stepped outside to run a couple of errands and there it was, in all its glory. We could see the Fitz Roy perfectly from town and actually found out that we could reach the trailhead by foot, just a short walk from the town center. Since the trail was so easily accessible and camping was free in the national park we didn't waste any time. The next day we hit the trail, slightly disappointed that the clouds had come back and were covering the tops of the mountains. We hiked to the base of the Fitz Roy traverse on a moderately difficult trail that afternoon and set up camp. The next morning was one we will never forget. We woke up around 5am to completely clear skies, a full moon and so many stars it didn't seem real. Admiring the peaks being illuminated by the moonlight we noticed two faint flickering lights in the distance. We quickly realized the lights we had spotted were headlamps and people were hiking even higher and closer to the base of the Fitz Roy on a trail we didn't even know existed. The view of the Fitz Roy from our tent. We made an easy decision to grab the camera gear, breakfast and a sleeping bag to stay warm, and head to the top for sunrise. After about an hour on a very difficult trail we made it to the top, just in time. It was a sunrise like we'd never seen, orange and pink streaks across the sky and painting every single peak red. The hiking that day was just as incredible. The skies stayed clear for us, showing off Cerro Torre, the whole Fitz Roy traverse and showering us with sunshine. Maybe it was the fact that we hit such an amazing weather window or because it's just that incredibly beautiful, El Chalten and hiking in Los Glaciares exceeded our expectations and remains as a solid first on our list for hiking in Patagonia. If you're not quite sure if you have it in you to grin and bear the Dientes, but are looking to be one with nature a little longer than the 3 day trek of El Chalten, then maybe the very popular Torres del Paine is a little better suited for you. Paine Grande Camp, one of the park's entry/exit points. Torres del Paine National Park was a conflicting, bitter-sweet experience for us. To start on a positive note, we were surrounded by stunning beauty around every corner of the trail. From the towering, horn shaped peaks of the Cuernos, to the Torre (3 granite peaks that give the park it’s name,) and the magnitude and presence of Glacier Grey, it is not surprising that people travel from all over the world to see the park this time of year. We, among many others put this gem near the top of our list to hit while the weather was good in Patagonia. It was hard to put into scale just how massive the Andes were when we were hiking below them. Just as we thought we'd seen the highest peak, another layer of even bigger cliffs would appear as the haze was burned off by the sun. Condors (the national bird of Chile, Bolivia, Ecuador and Colombia) would hover above us looking like ants even though they have a wingspan that can reach 10.5 feet. 3 Condors hovering below the clouded Cuernos in Torres Del Paine. The downside to all of this allurement is that Torres del Paine (TDP) attracts a number of people that the park is not prepared to handle. The high season of TDP is December-March, summer time and the short time of the year when it's less likely to snow (side note, it still probably will.) Hundreds of people had taken over the campsites. While we were there, there was no permit system or limit to the amount of people they allow in the park per day. The campsites never turn anyone down, they just keep piling tents in, packing them as close together as possible to maximize profit. Wildfires in the park a few years back lead to a ban of any type of fire in the park including the use of cooking stoves outside of the park's assigned cooking areas, which meant shoulder-to-shoulder people trying to cook in a room the size of your living room. They had also banned camping anywhere but their few designated campsites. Anyone who breaks the camping/cooking rules face consequences of up to $2 million chilean pesos in fines and a lifetime ban from Chile. Conditions were unsanitary and overcrowded. This many people in such close proximity, a lack of infrastructure, and nature’s inability to keep up with the crowds was a recipe for disaster. Shortly after leaving the park one of the campsites was closed after around 35 people were hospitalized from an "unknown" cause, likely contaminated water. We hope the national park management will be more mindful in the future about the well being and conservation of this delicate landscape. Hiking in southern Patagonia was exactly what we expected in some ways, and in others a complete shock to the body and mind. We got our arses handed to us on a few sections of trail, kept trudging forward when the weather got tough, and proved to ourselves that we are capable of more than we know. We were taken back in time, forced so step outside our comfort zones and reminded of how important it is to protect the wild places we have left. Resupplying the refugios the old-fashioned way. Keep your eyes peeled for part 2 of our Patagonia exploration.